There are several well known sword findings from early medieval age in Slovak and Czech republic. Most of them are highly decorated, without any doubts associated with an individual ranked at the top of the society (ex. 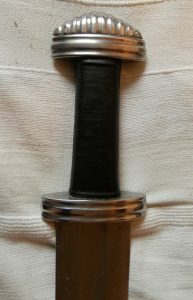 sword from Turčianska Blatnica). However, this kind of sword is not appropriate for me to own and present together with my reenactment equipment. I do not aim to represent a social status of extraordinary wealth as such representation would require me to possess the equipment that would cost a fortune and would necessitate a great responsibility during its reconstruction. After considering some swords offered by the shops and blacksmiths, I was given a perfect finding to reconstruct. An archeologist from the Archeological museum of Slovak national museum gave me the source materials for a sword that was probably never reconstructed and should perfectly meet my requirements. The sword from Smolenice differs from the average by its unusualy short lower guard of only 8 cm while the finding from Skalica has the lower guard of 8,9 cm and the finding from Gradec kod Drniš 9,8 cm. 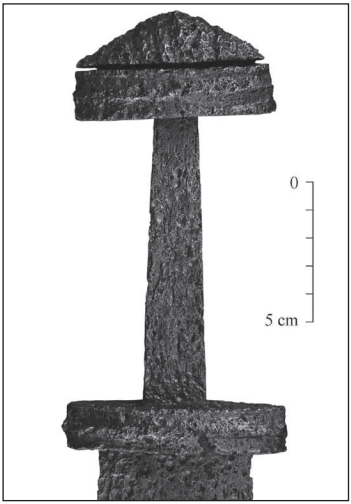 (Turčan 2011: 131) The sword from the grave n. 265 from Mikulčice posseses the lower guard measuring 10,1 cm. (Košta-Hošek 2014: 77). As I already stated, my choice for a manufacturer was Luděk Vobořil, a Czech manufacturer with a great portfolio of swords. The replica is of good quality with mostly minor deviations from the original measurements. Unfortunately, due to the error of measuring and understanding the article, the grip of the reconstructed sword was 11,4 cm long which is way too long for an early medieval sword. The manufacturer however shortened the grip to its proper lenght. Besides some small changes from the original form in the area of blade and fuller the manufacturer had to reconstruct the point of the sword with minimal data as the point was damaged and missing. As for the material I had to change the original material in the reconstruction of the blade. The original blade was pattern-welded but this technology would be both expensive and inconvenient for the purpose of reenactment and anticipated blade contact as the replica is made blunt for the same reenactment purpose. 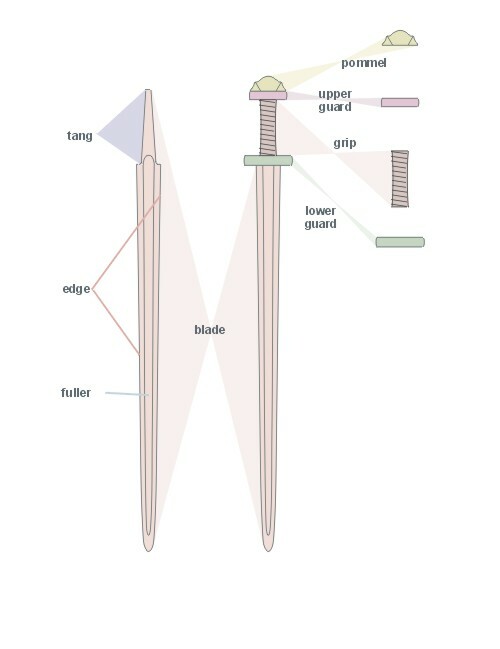 This choice together with the need to reconstruct the edge and tip of the sword increased the weight of a sword to 1284 g (from 1192 g of the original finding). In the future I plan indeed to aquire a proper replica sword with a sharp edge and proper manufacturing technology used. That sword wouldn´t be used for blade contact but only for an authentic representation of history. Another decision I had to make was one concerning the grip. An adjustment in the lenght of the grip would be a step towards the comfort of handling in possible protective gear but as it would change proportions of the original it would decrease the authenticity of this reconstrucion and the original attrubutes. I chose to keep the measurements as authentic as possible . 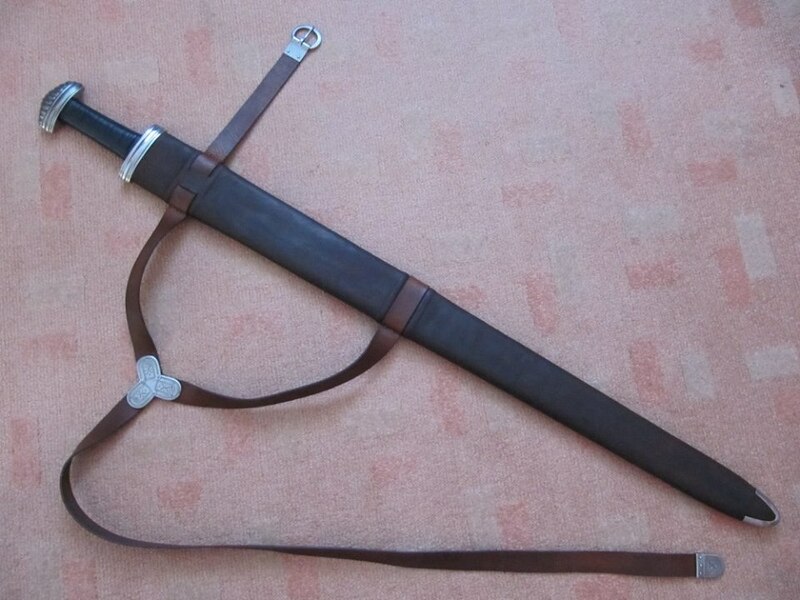 The next logical step was to find it a proper scabbard equipped with a dedicated belt separated from my civil belt. At first I thought of manufacturing a scabbard on my own but then I decided to order one from the professional. The right person to ask was Roman Král from King´s Craft. 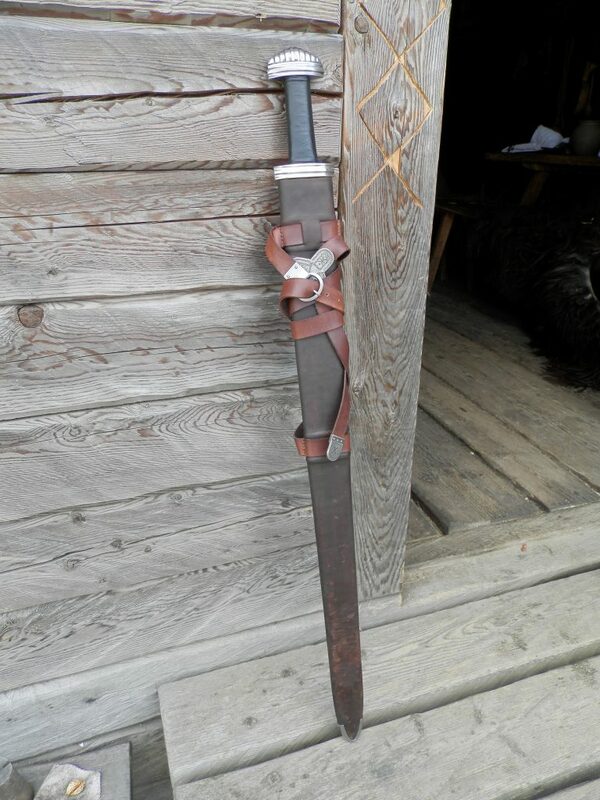 He crafted me a scabbard with wooden core, wrapped in linnen and with outer layer made of leather. The scabbard´s suspension is made in accord with the interpretations of Carolingnian scabbards and equipped with metal fittings. The metal mounts are made of iron and corresponding to a find from Dolný Kubín in Slovakia. To conclude, despite some minor reservations to this replica of the sword from Smolenice I am quite satisfied with the outcome that is well suited for the period and region I try to reconstruct. The possible setting of the production of this type of swords to the end of the 8th century/beginning of the 9th century is convenient as it is the same period in which my reenactment group is engaged in. I find the question of authenticity very important and as long as there is a possibility to reconstruct the material culture from the conditions we reenact, it should be our first choice. This entry was posted in Nezaradené, Zbrane and tagged early, early medieval, karolínsky, meč, medieval, morava, raný stredovek, reconstruction, reenactment, RS, Smolenice, stredovek, Svjatogor, sword, včasný, včasný stredovek, velká, vikinský. Bookmark the permalink.